How are audiobook narrators faring in the ever-expanding audiobook business? Audiobook sales growth is indeed explosive: doubling in both 2012 and 2013 to $1.3 billion in U.S. retail sales in 2013, according to the Audio Publishers Association. And research organization IBISWorld pegs 2014 audiobook sales at $2 billion, growing 12.7% annually. Generally, there are three - sometimes overlapping - components of this business: the rights holders (book authors), publishers/producers, and narrators. Business boom times see winners, losers - and those in between - as players adapt to what works and what doesn't. So we ask again: how are the narrators faring? "Having 'paid my dues,' so to speak, I'm beginning to ask for more money, and getting what I ask for." "I make a lot more in other VO genres, for a lot less work. "I do 50+ books a year to make just a little over 100K. If rates were higher I could relax a little - but I don't see it going in that direction." "I'm satisfied because I know the potential is there as I improve my craft." Are any of these YOUR views, too? We've got hundreds more to share - along with capsules and analyses describing today's audiobook narration business - in The Audiobook Narrators Business Survey Report - 2015. The report is based on what we believe is the first widespread survey of audiobook narrators, conducted online in January 2015 by VoiceOverXtra and audiobook narrator / voice talent-coach James (Jim) Conlan. Questions ranged from what types of projects narrators prefer, to how they record, how they are paid - and what they are paid. And the results range from what you'd expect to learn, to some that raise eyebrows, plus a sizable amount of opinions on what narrators believe should be improved. Your comments are always welcome, too (please participate through the COMMENT box at the end of this article). Exactly 300 narrators responded to the Audiobook Narrators Business Survey 2015 - anonymously. 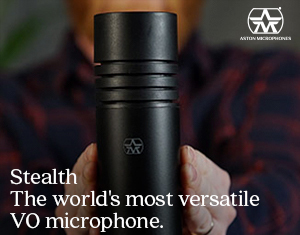 Invitations to participate were sent to VoiceOverXtra subscribers and many voice over social media venues, with a link to questions on the automated Constant Contact survey system, which also tabulated the results. Overall, the participants represent newcomers and seasoned pros. For instance, 55% have been narrating audiobooks for three years or more, and 26% indicate they are union members. Many specialize in niches of fiction and non-fiction - though half add that they will do "whatever appeals." The vast majority of respondents record in their personal home audio studios, and a good number skip the tech stuff - at least occasionally - by outsourcing the editing. Most obtain work through auditions, but well over half also obtain work through direct contact with a publisher or author. They are compensated in a number of ways, including fee per finished hour (most popular), royalties, stipends, flat fee, and combinations of these. And how much do narrators earn? Annual income from narrating ranges from under $10,000 (most common) to over $100,000. Following are details about the respondents and what they do. Tomorrow, Part 2 reveals details about compensation: how and what audiobook narrators are paid. About half of the respondents have considerable experience in narrating audiobooks: 37% have been narrating for three to five years, and another 18.3% have been voicing books for six years or more. And this roughly correlates with the number of audiobooks they've narrated: 41% have narrated more than 21 books, including nearly 13% who've narrated more than 100. It's no "fiction" that narrators jump at variety. Close to half of respondents say they'll narrate "whatever appeals." 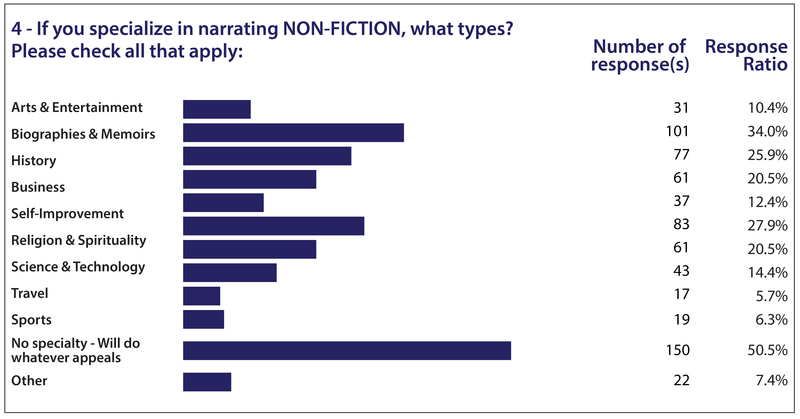 But there's also a very clear preference for specializing in certain niches in fiction and non-fiction. Of course, narrators might have more than one specialty. Mysteries and Thrillers are top choice among those who narrate fiction books, followed closely by Science Fiction & Fantasy, and third, Romance. 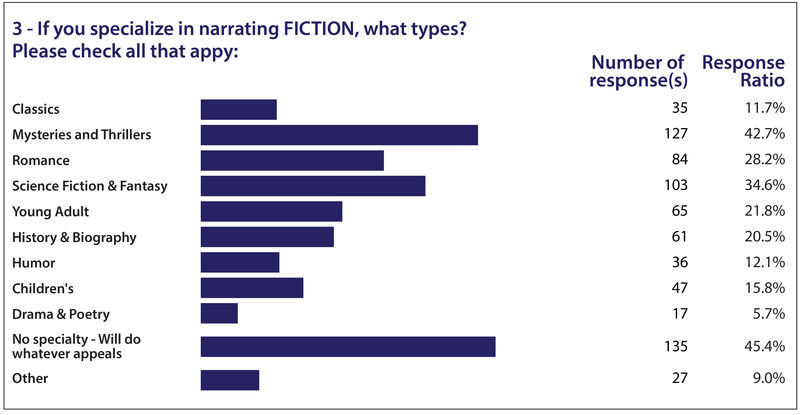 Young Adult and Children's combined is preferred by more than a third of the fiction narrators. In non-fiction, Biographies & Memoirs are most popular, followed by Self-Improvement and History. Tied at 20% each are categories of Business and Religion & Spirituality. At least 26% of respondents indicate they are union members. And nearly 41% of them believe that union membership enhances their chances of obtaining audiobook projects. Slightly more than 63% of respondents obtain audiobook work directly from a publisher or book author. Yet the most common job-getter is an audition. Please click here now for James Conlan's 'Beyond the Numbers' analysis of the data, and comments about the comments! 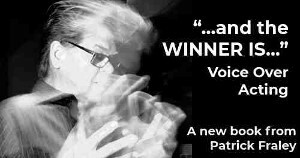 John Florian is a voice actor and publisher of VoiceOverXtra, the voice over industry's online news, training and resource center. 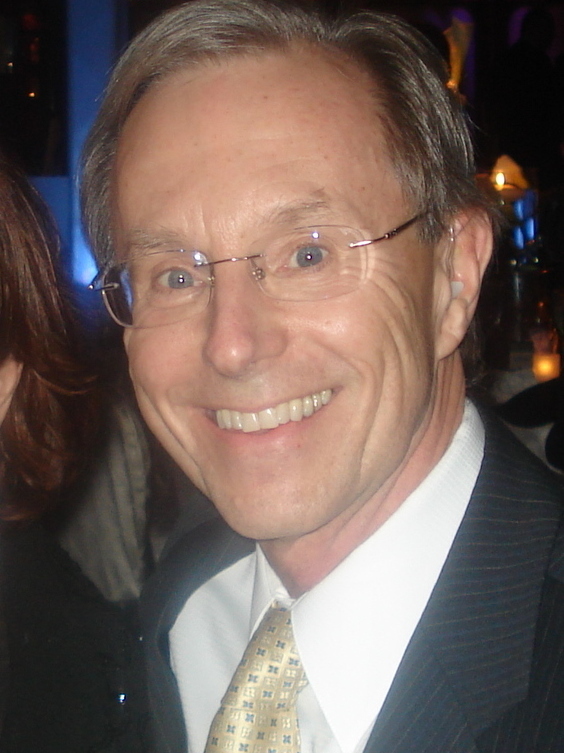 A former print publishing executive and magazine editorial director, he founded VoiceOverXtra in 2007, which today offers the voice over community industry news, how-to features, online and workshop training, the Voice Over Legal guide, and an ever-growing online resource center of articles and links. In 2013, he produced Voice Over Virtual, a major online industry conference. 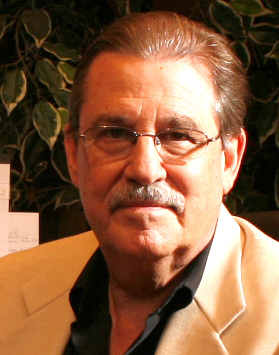 Jim Conlan has led a dual career for most of his adult life: advertising executive and voice talent. As a founder of Radio Works, he has written and produced thousands of radio commercials for clients all over the country. As a voice talent, he learned from some of the best in the business by directing on an almost daily basis. Jim now devotes most of his time to training voice talent, doing voice over projects, and narrating audiobooks. Some 40 titles are currently available on Audible under the name, James Conlan. "So I wasn't just a co-author of the survey," Jim says, "I was a respondent!" I am so glad to see the data on this. This is very informative and is positive confirmation. Superb! Incredibly illuminating, even over here in UK. Optimistic, too. Like other people, I love to do a book but have to steal the time from potboilers that pay. With the increased demand, it could be that situation will improve. I am so glad that this survey was done. It encourages me to continue with the work that I have chosen to do in my "retirement years." Audiobook narration is something that I will continue to do because I love the work. In spite of the urging by all of my coaches, I do NOT want to do anything else. 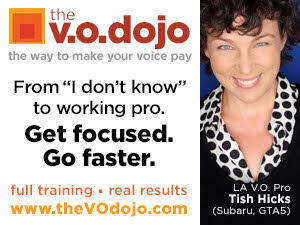 All of my coaches, BTW, tell me that I am good at it, but say that (they think) I am also good at other aspects of VO. But, audiobooks are my love. I realize that I may not make a lot of money at them, but that's not why I do them. My thought is that, if I can concentrate on improving my narrative skills, aiming to go beyond my "personal best," my goals will be achieved. Last year, I achieved an average of a book a month, but I was exhausted by the end of the year. This year, I hope to narrate fewer books during the year because I do not want to lose the enjoyment of VO.